As part of our Grand Day Out Series, we were paid a visit by Georgia Leslie, possibly the luckiest 19 year old in the world, and two very different bikes from Specialized. 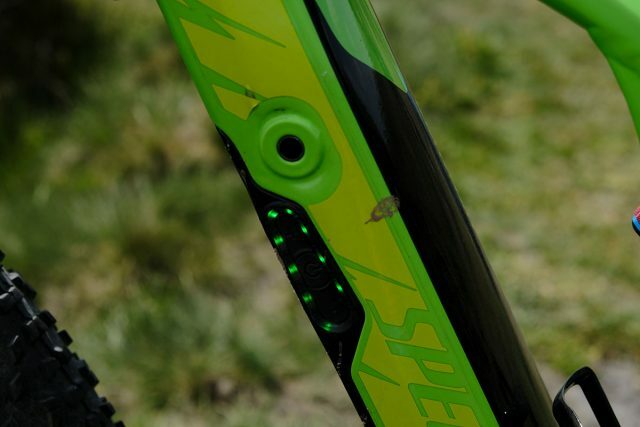 Anyone who rides bikes on even the most part time of basis is likely to be familiar with the Specialized brand. As a huge brand catering for almost every bike genre niche there is (carbon fibre aero tandem anyone? ), and every price point, it’s pretty much a household name. Last year we had the honour of co-hosting ‘An Evening With Ned Overend‘ with Specialized – Ned being a long time sponsored rider and brand ambassador for Specialized. However, between all the char, pies and beers, we didn’t get chance to actually ride bikes. It was time to put this right, so Georgia Leslie, the new ‘PR Specialist: Offroad’ (to give her her official job title) came up to ride our trails and show us her bikes. Georgia has good reason to look happy all the time. Coming all the way from Surrey, Georgia could have been forgiven for thinking she was going to experience dark satanic mills, gritstone slop, and grey skies. 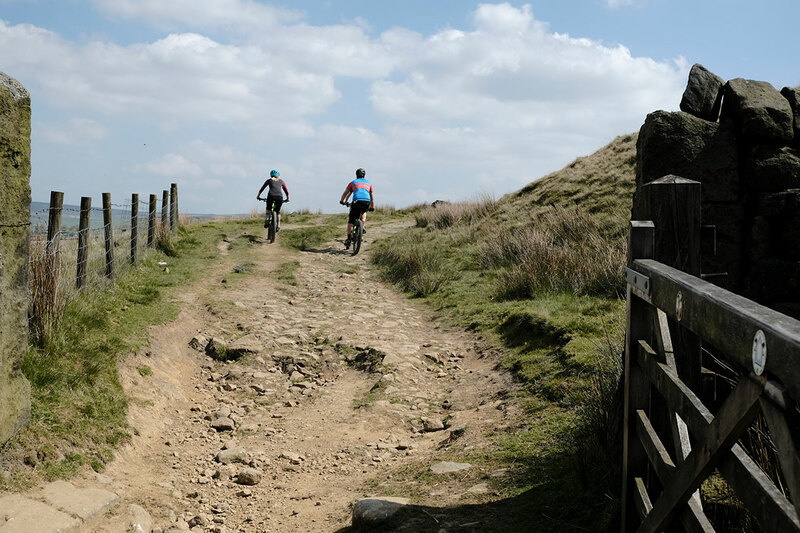 Of course, this is just a myth that northerners perpetuate to keep the southerners from moving here and making our trails too busy, and the hot sunshine, warm breeze and dusty trails were entirely typical of our Yorkshire setting. OK, we admit it, we were just as giddy with excitement to have an excuse to play out in shorts and t-shirts. The excitement wasn’t confined to the weather however, as Georgia brought with her two very different bikes. One, a Specialized S-Works Epic Hardtail World Cup, was a glittering peacock of a race hardtail – but there was only one of them. With a frame that is lighter than Specialized’s lightest road frame, everyone in the office took turns to lift it, stroke it, and coo ‘Ooh, isn’t it light? !’ before tilting it back and forth so as to better appreciate the purplish blue metallic finish ‘Blurple’, suggests Georgia, although the official Specalized term is ‘Satin Chameleon’. But there’s only one of these racing beasts, and Wil (the closest thing we have to an actual fit lycra snake) is away on a product launch. So what are Chipps, Ross and Hannah going to ride? Happily Georgia has brought along four Specialized Turbo Levo FSR Comp6 Fatties, so not only are we going out to play in the sun, but we’re barely going to have to break sweat. Let us at those dusty trails! But no. We can’t leave just yet. 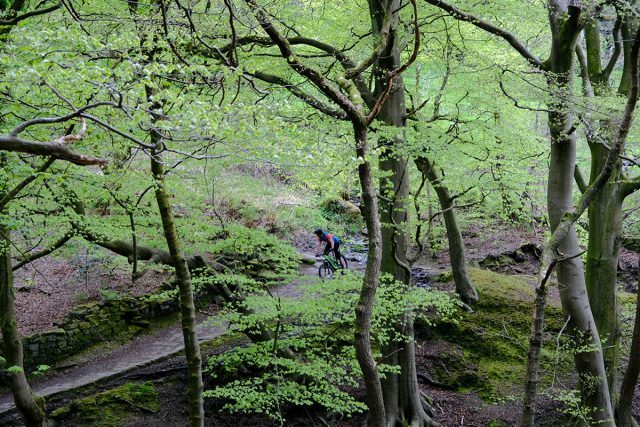 Going for a ride on a test bike is not the same as going out for a ride on your own bike. Everyone needs to set their saddle height, fit their pedals, set their tyre pressure, and set their suspension. And that’s a bare minimum. Ross decides to alter the height of his bars, taking off the headset and swapping spacers around. Now we’re ready. Power control and battery life indicator. But no again. Despite the lack of LCD screens on the bars, these are e-MTBs, and we need to know how to operate them. 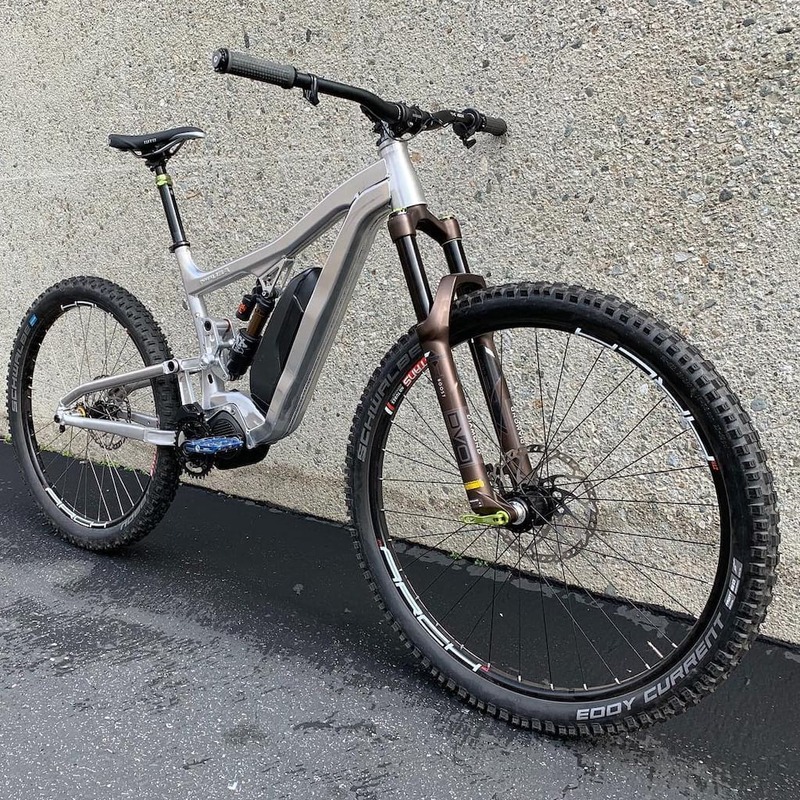 Each of the bikes in this test fleet has the additional Wireless Turbo Levo handlebar control, plus there’s a ‘Mission Control’ app we need to install on our phones in order to get the most out of the bikes. 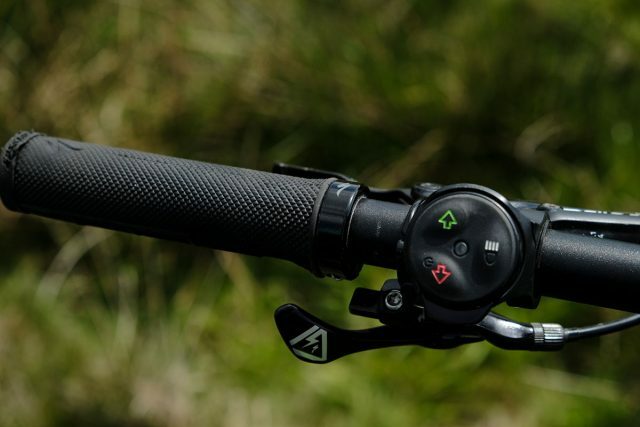 Without the wireless handlebar control, the bike’s assist mode is varied by pressing the buttons on the left hand side of the down tube. On a bumpy trail this takes a bit of getting used to and the handlebar adjust is welcome, however, with the app engaged you can avoid the need for manual adjustment altogether. Additional remote assist controls were fitted. The app performs all kinds of ride tracking functions, but also allows you to plot a route before you set off. 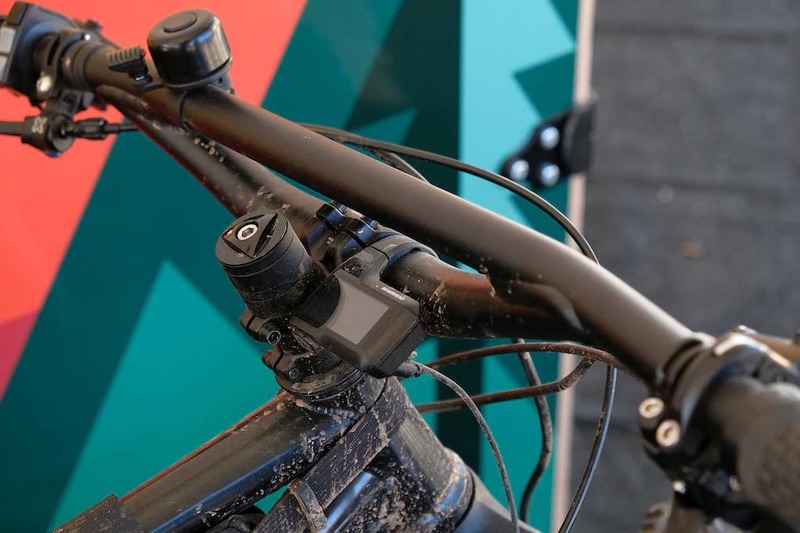 You can use this to give you turn by turn navigation (although we didn’t try out this feature so can’t comment on how effective it is off road), and to tell your bike that you want to get home with a certain amount of battery left. Handy for those who are worried about running out of juice. 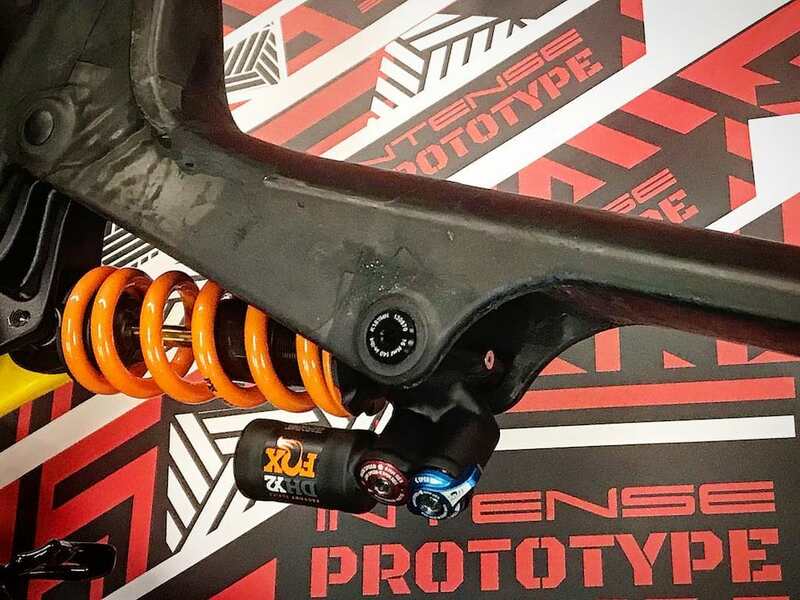 The app and the motor work together during your ride to alter the amount of assist you’re getting according to the terrain you’re riding, the effort you’re putting in, and how much you’re draining the battery. This picture says it all. Think of the bike mode curve to be your car gas pedal (with a spring behind it), how hard you must push the gas pedal to get to full power of the motor. The Motor Current is the size of your engine. In this picture, you see in turbo model you only must push 125W to get full power. In Trail mode, the full power is limited (smaller engine) you must push 190W to get full motor power of 400Watt, in Eco mode you must push really hard 270W to get full power of the smallest engine 300W. The app allows you to adjust the percentages so that the rider can customise the three settings to their preferred outcome, either longer rides or more power! Back to our test ride, we’re bluetoothed up, the power is on and we we’re finally ready to head for the hills. 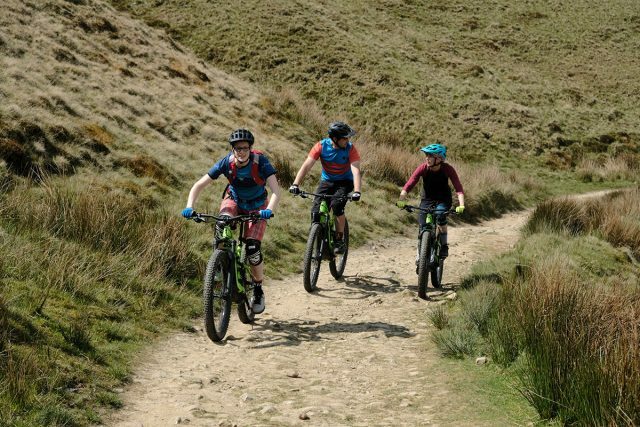 And hey, we’re on e-bikes, so let’s do as many hills as we like! Just as well we were on e-bikes, with all the chatting we were doing. Up, along, more up, and hey, while we’re here, let’s stick in that up we don’t usually bother with. There’s a nice view of the moor at the top. Georgia is blown away by the countryside. She can’t believe how much of it we have. We point to a hill in the distance: ‘Shall we go over there?’. And so we head down, quickly losing all the height we’ve gained, but without any of that nagging sinking feeling that sometimes comes with blowing away all that ascent in a few minutes. 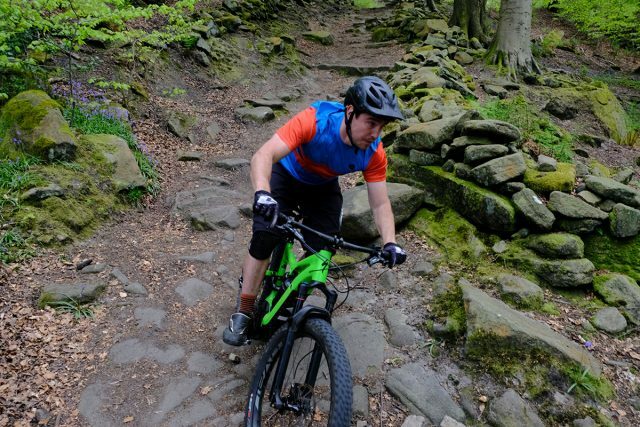 Descents without the pain of the ascents? 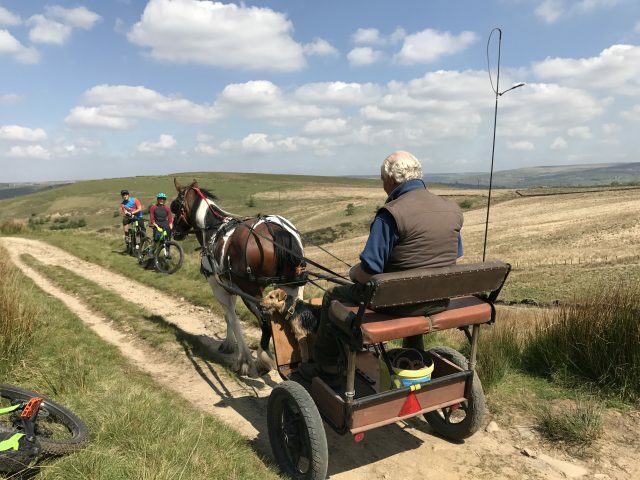 Not only does the sun shine and clouds of dust rise from our wheels, but Yorkshire does a fine job appearing like something straight out of Last of The Summer Wine. We meet a guy driving a pony and trap along the London Road bridleway, complete with dog riding on the trap. Georgia looks at us as if she’s landed on another planet, and in this instance we’re just as surprised as she is. 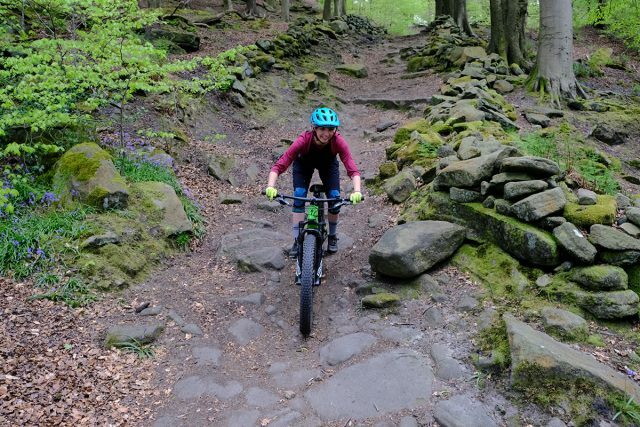 There’s something extra amusing as this throwback from the past happens as we’re riding the most modern of bridleway using contraptions: e-MTBs. As we ride we bump into various people. Georgia has a chat with a couple of mountain bikers, one of whom is on a Specialized bike, and Hannah seems to know everyone else we meet along the way: a post woman, someone walking a dog (she knows the dog’s name too), a woman out for a stroll in the sun. The impression of being in a TV serial where everyone knows everyone is compounded. Let’s go for another up. 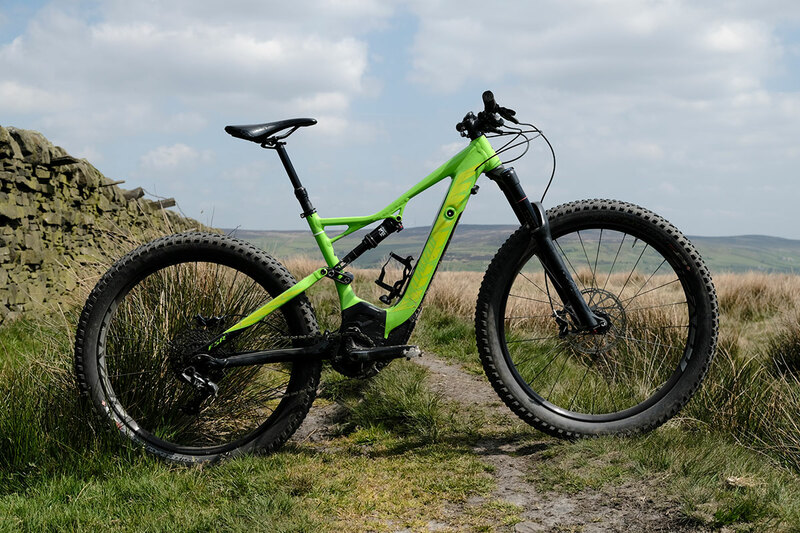 Another climb, another trail, and then a short moorland push where the rough and the steep contrive to defeat even the turbo setting on our Levos. At this point we notice the lack of a ‘walk assist’ function, but the push is short and the view at the very top of the world is worth it. We attempt a Facebook Live broadcast, but the wind changes, or a curlew sits on the antennae, as we drop from 4G to nothing. Perhaps it’s just as well, as Georgia has the giggles. We embark upon a series of aborted attempts at recording a video. The next descent is long and meandering, well worth breaking sweat over the push to get to it. We arrive at the bottom and eye up the trails on the other side of the valley, but decide that really, we’d best stop having quite so much fun and head back to the office to do some corporate work type stuff. Oh, and eat pies. Refuelled with pies, we get ready to do a Facebook Live on the Epic Hardtail. Somehow during the preparation for that we establish that Georgia is 19. For a moment we’re all quiet, part of us trying to figure out if she’s kidding, and part of us working out what we were doing when she was born. Chipps asks how old her parents are and realises he might even be too old to be her dad, Hannah realises that she is old enough to be her mum. I still have to pinch myself when I get to work every day! Honestly, It’s been a bit of a whirlwind – I still have to pinch myself when I get to work every day! My parents were both keen riders and my Dad got me into riding when I was only about 3! We still ride together all the time on our local trails around the Surrey Hills.I started down the usual route, working on the weekends and school holidays in LBS from the age of 14 on the weekend’s and during the holidays. I completed my A Levels and then applied for a Business and Management degree at University and received an unconditional offer, however, I decided I wanted to take a gap year to do some travelling before taking that jump. 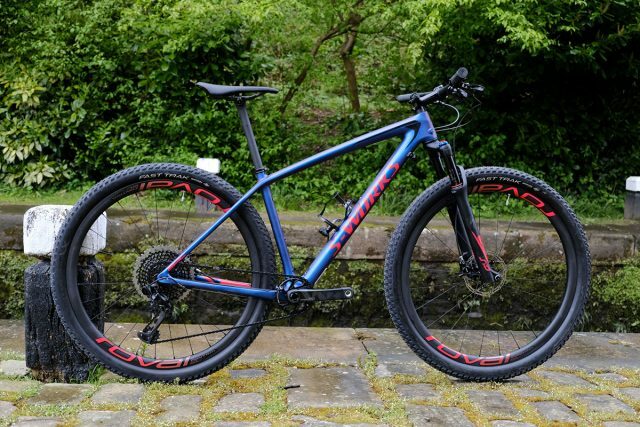 During that time, I moved up to full time at the bike shop and then received a message from a friend who worked at Specialized UK, telling me to apply for an open position, I thought “Why not? !” so I did! I started out as the Test Fleet Coordinator, looking after the logistical side our in-house demo fleet of over 200 bikes. 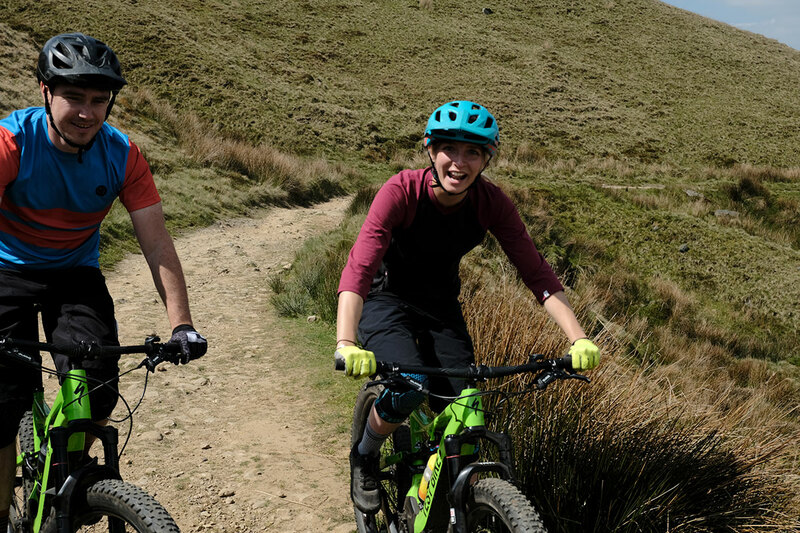 Specialized allowed me to take the job, then take a quick time-out to go travelling in New Zealand. I spent about 18 months in the Test Fleet role before our existing MTB PR guy, Justin, moved to take a role within S-Racing. A few of my colleagues told me that I’d be great at it and after a bit of persuasion I threw my hat into the ring and here we are! Sounds pretty dreamy, huh? We bet there’s a few people on there looking at their student loans and never actually used degree and feeling a bit sick (let’s face it, most of us have a degree in something that has rarely been of any practical application – except maybe that one time the pub quiz had a surprise round on 19th Century theories on crime and punishment). Georgia certainly knows how lucky she is, and this may well explain her constant grinning and giggling. She’s the cat that got the cream, ate the cake, jumped over the moon and got away with it all. It has been slightly daunting at times – MTB PR isn’t exactly known for having many women in it, let alone 19 year old ones! I’ve had awesome support from my colleagues, both in the UK and at the mothership in Morgan Hill and it’s a total dream job for sure. Sigh. Well, before we get all ‘oh if I had my time again’ maudlin and reach for the gin, we’ll leave you with the final cut of the video (they got their straight faces on in the end) where Chipps and Georgia talk about the Turbo Levos. Which are definitely not just for old people. Although when you’re 19, pretty much everyone seems old, right?